oh, it really IS the little things! I could do nothing else for the next five days and still feel like I accomplished something. 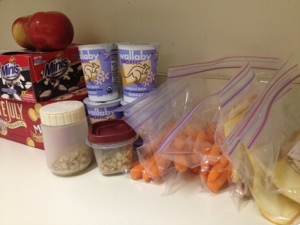 I finally did something I have been wanting to do FOREVER: I made all my lunches for the week on Sunday night. Now, to be as green as possible I usually try to reuse my sandwich bags until they are falling apart so I was claiming that was the reason I wasn’t doing it but really it was because by Sunday night my get up and go…got up and went, as my mom used to say. [Clearly I can reuse these bags again next week and they are not getting any more wear and tear; isn’t it amazing how the mind allows you to rationalize in the most ridiculous ways? Well, that’s for another blog.] The silly part was that I don’t feel any less tired or lethargic or uninterested on any other the night of the week. In fact, I usually feel more tired as the week goes on. Just think of how amazing it will feel when you don’t have to think about this for the rest of the week, I told myself today. And, I did it. So simple, so small and yet I’m so happy.